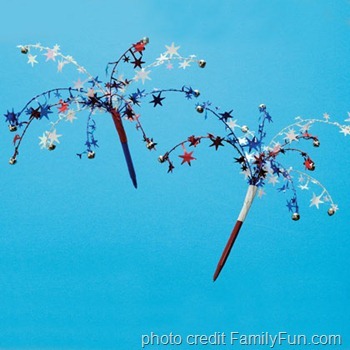 Here’s a quick 4th of July craft your kids can help with! You will need to cut the wired star garland into nine pieces, about 6 to 8 inches long each. Remove the tinsel stars from the last inch of each piece. Line up the trimmed ends on the sticky side of a 1-1/2-inch length of duct tape. Leave 1/2 inch of tape free on each side. Wrap the tape around the top of a pen to secure it to the pen. Slide small jingle bells onto the top ends of the garland lengths, bending the tips around the bell loops to secure them. Splay the garland to resemble exploding fireworks. These can be changed up a bit. For the younger crowd that cannot participate in setting off fireworks/sparklers… attach these to dowel rods instead so they have jinglers! These supplies can easily be found at a Michael’s store near you! Enjoy this Independence Day giveaway courtesy of Gift Cards Rock! 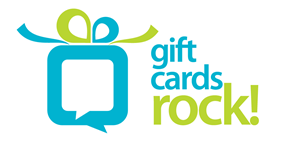 an online community for people who love to give and receive gift cards: http://www.facebook.com/GiftCardsRock. You can also find more gift cards for any occasion at your local grocery store! 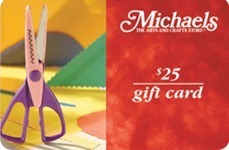 ONE OurKidsMom reader is going to win a $25 Michaels GC! This giveaway ended at 11:59 PM EST on July 17, 2012.
i want to buy a tie dye kit. I love buying holiday decor! i like to buy unfinished wood stuff… birdhouses, etc. I love getting scrapbook supplies!!! I love buying crafts that I can do with my kids. Ever since I started knitted, yarn is the splurge of choice. I love the dollar bins, and just plain old sketch books. I love buying scrapbook embellishments for making cards. They have a WONDERFUL collection of Hello Kitty items! Recycled bags, stickers, pens, etc…..all affordable too! Beads and stuff to make jewelry with. Let me see I would buy flower arrangements, yarn, crafts, and anything else I love there. I love that store! I love shopping for cake decorating supplies at Michael’s. When I go to Michaels I head right to the scrapbook section! It would be easier to say what I DON’T buy at Michael’s 😉 I’m always there! The first thing that came to mind was beads. I buy lots of jewelry making materials at Michaels. My favorite to buy at Michaels is ribbon and scrapbooking supplies. I also like to shop clearance after Christmas! I love to purchase craft projects for my kids from there especially during the Summer time. My kids love stamps from michaels! paint, scrapbook materials, and frames. I am a material hog so I love to buy my material and sewing supplies! Love all their cake and cookie decorating items! I love their kids crafts kits! I love getting all of my crafty stuff at Michaels! The last thing I got was a foam wreath form and shells. Tell me your favorite things to buy at Michaels in the comments section of the blog below. yarn and sharpie markers…for use with different things, but still. I like to get paints & brushes. I love to buy scrapbooking supplies at Michaels! Spray paint 🙂 Love turning old things new with just a coat of paint! I like to buy their paintable ceramics to work on with my kids. I love to buy crafty stuff for my kids to do, which is hard since I have 3 boys. I also LOVE to buy holiday stuff!! Thanks so much for the chance! Love the scrapbooking supplies, and artificial flowers, craft supplies, everything! I like to buy Picture frames to give as gifts with pictures we’ve taken while backpacking. I like buying crafting supplies for the kids like markers and paints. Thanks for the chance to win! I love to buy scrapbook supplies. I like buying Wilton cake pans. I love making my kid’s party invitations and thank you cards so for sure card supplies. I love buying all my holiday decorations from there!! I like to buy scrapbook paper and accessories. Lately I have been picking up iron-on decorations for t-shirts. I like to buy fabric and sewing supplies. I like to buy beads for arts and crafts. I love the dollar bins and I spend a ton o’ cash in the cask decorating area. Painting supplies are my favorite purchase. I would like to buy some decorative items at Michaels. I like to buy scrapbooking supplies. I buy beads…lots of beads! I love to buy frames and holiday decorations. I love to buy cake decorating supplies! lately it’s supplies for our DIY wedding !! I like to purchase scrapbooking supplies. They have a great selection. My favorite is picture frames. Soapmaking supplies! Molds, scented oils, and add-ins, and they have a great selection. we make our own baby headbands! I go to Michaels atleast once a week lol i buy a lot of DIY products .I buy everything from rhinestones,craft paper,party supplies,etc . i would be in HEAVEN if i won because as much as i love Michaels it is pricey and to make it worse im a broke full time mom /student . I love to buy their wood shapes to paint. I like to buy scrapbook supplies.Thanks for the chance. Great place to get scout pinewood derby stuff. I like to buy craft items for my grandkids. I love buying craft supplies for candles. My favorite thing to buy at Michael’s are photo frames. They have so many options. I love to buy all of the cake decorating items from Michaels that and anything from their 1$ bins.. I love all things crafty at Michaels, but I would say the bulk of my purchases are holiday related! I love to buy items for scrapbooking. I love buying all kinds of crafty things at Michaels, wooden shapes and paints and felt squares and kits… the kind of things you can’t wait to get home with so you can make something! I buy art supplies and scrapbook supplies at Michaels! I like to buy adhesives and embellishments for card-making and scrapbooking at Michaels! I love making bracelets and scrapbooking! Right now, foam kits for my little girl. She loves to play with the foam stickers and kits. I like buying Pastel pencils and sticks. I love the selection of frames at Michaels. I always find unique frames at Michael’s. I love buying EVERYTHING at Michael’s–especially ribbons & fabric paints for decorating tee-shirts! I like to buy jewelry making supplies for my niece. I love to buy fine art supplies – paint, canvas, etc. I love to buy scrapbooking supplies! I love all the scrapbook stuff. The dollar stuff at Michael’s is always a lifesaver! I would get scrapbooking supplies. I love buying paints, paint brushes and canvases for my artistic creations! I buy alot of yarn. The yarn section is my crack. I love to buy yarn there. I like to buy supplies for crafts I’m working on. Things like photo frame crafts, wood crafts, and baskets. I often go there for cake decorating supplies and craft supplies for the kids. My favorite things to buy are arts and crafts for my kids! Like glue, glitter, paper, scissors etc! I’ve only ever bought glitter from Michael’s to put in the paint of the door switches in my car. I REALLY want some cake decorating stuff I saw when I was there though. I like buying yarn because they always have great sales on it. I like shopping at Michael’s for scrapbook paper, albums, and stickers. I love to buy Scrapbook paper. My favorite items to buy at Michael’s are beads. We like buying sculpty clay! I love to buy fabric, yarn, and holiday decorations at Michaels. I love buying scrapbooking supplies! I like to buy acrylic paint at Michael’s. Thanks for the giveaway. I buy jewelry and painting supplies at Michaels. I love the huge selection of crafts for children. I like to buy jewelry making stuff. paint and other art supplies! I love buying the holiday craft kits like a Halloween house or Easter bunny village! I like the holiday craft kits! I like to buy small craft kits for the kids to do! I like to buy craft kits for the kids. I like to buy scrapbooking items. We like to get various scrap booking items! We like to buy craft kits at Michaels. I like to buy glass paint. There are so many things that I love, but if I had to pick I would chose the kids crafts. we used to buy a lot of the fake flowers so my wife could make wreaths. they have a great selection. now it’s fun to go in there and let the kids pick out small crafts that will keep them busy for a while. Beads and other jewelry making supplies. I love to buy all sorts of various items for science labs I make up as a teacher. I love buying scrapbooking stuff there! I like buying seasonal decorations! i would buy silk flowers and make crowns. I like buying frames and vases! I love buying supplies for scrapbooking!!! I like to buy notepads, soaps, candles, toys, etc. for stocking stuffers. Art supplies for my kids. I buy a lot of the fun foam craft kits for my Girl Scout troop. love their great selection of frames! I like to buy craft items. I like buying jewelry making supplies. I have an 18 moth old son who is a budding artist! Michaels is great for a variety of crafts that even my little one can love and have fun with! I end up getting all of my frames there but have also gotten a lot of craft supplies for decorating the nursery. I love to buy Halloween and Christmas decorations at Michael’s! I love to buy their paints and stencils. I like to buy decorations for Christmas and other holidays. I like finding cute little things to decorate with. my favorite thing to buy at michaels is paint, i love to paint! I love buying yarn at Michaels; I’m an avid crocheter! I love to buy stuff to add to my steampunk outfit! I love Michael’s for the craft supplies, especially flowers. I like buying drawing supplies and holiday decor. I usually like to buy cross-stitch kits! Love the crafts that they sell, I buy them for my granddaughter and grandson. I like buying fabric ect..
i love their great selection of scrapbooking stuff! I always buy my picture frames there. They have great sales. I usually go between 2 things scrapbook stuff, or candle scents. Michael’s always has good quality frames, which I have purchased on many occasions. I mostly buy yarn, canvases and sculpey! I love to get christmas decorations!! I love to buy yarn and other stitching supplies – Thanks! Craft supplies for the kids and fabric. I love to buy Scrapbooking supplies at Michaels. I buy their Wilton cake decorating stuff! I like to buy beads. I love to buy my supplies for embroidery there. Fall holiday decor for Halloween and autumn in general. Love it! Scrapbook paper! They have better selection than other places near me. I like buying jewelry supplies, and Christmas decor! My favorite thing to buy at Michael’s is seasonal items (especially Christmas items). Def kids stuff! We like looking through clearance or using the coupons! My favorite things to buy at Michaels are baskets. Excellent tip for any just one looking to design a web-site with ad generating revenue!